Pocketwatch Theatre Company are a Devon based company, passionate about producing fun and engaging storytelling theatre for children and adults. Over the last seven years they have had a returning residency at Powderham Castle during the school holidays, entertaining thousands with a different themed interactive performance each week. They have also taken their performances to other alternative venues such as Hannah’s at Seale Haynes and Torquay Museum. 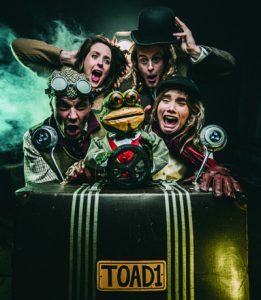 Their adaptation of the timeless children’s classic, Wind in the Willows, features actors, musicians, hand-crafted puppets and an entirely original score.